It seems to be holding the pedal box, but in typical catch 22 fashion I can't get to the cables or pedals with this box in the way, and I can't get the box out of the way because it's bolted to the main body (and hopefully through to the chassis !) with at least 5 bolts that I've found so far. 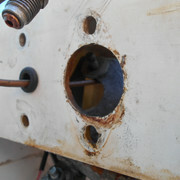 It seems robust as all get out, which is comforting if it is all that's holding the pedal box up, but is there any reason why I shouldn't cut an inspection hole in the left hand side front, so at least I could see what's inside and get a socket extension in to release the bolts holding it to the chassis? 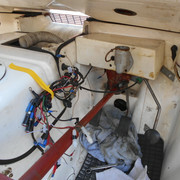 I need to get this lot apart so that I can remove the brake master cylinder - at present I can't even see the pivot where it's connected to the pedal, much less reach it to disconnect. All suggestions gratefully considered! Thanks. I now know all about this box - it's just a body extension to hold the pedal box, but obviously a poorly thought through bit of design. I have cut three 52mm diameter access holes in it and life is *so* much easier, so for any Webster owners out there I strongly recommend this mod before you even think about doing any work in this region. 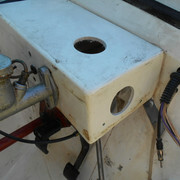 The photo only shows two holes, but I cut a third one on the left front to allow access with a socket extension to the two bolts holding the (white) box in place. 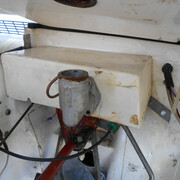 What you can't see is an internal stiffening gusset just to the left of the pedal box, so from the underside the white box actually has two 'compartments'. As it happens I didn't need the pedals out on this occasion, but to remove them in future will require cutting the brake pipe off. I chose 52mm as rubber blanking plugs are readily available on eBay to cover in the holes. £1.85 for 5-off, delivered.